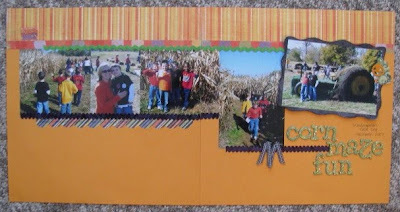 I have continued to play along with the Croptoberfest challenges at Personal Scrapper. Go me! We were challenged to scrap someone we admire and use a word to describe them in our title. I admire Tom and the boys. I love how much fun they have. 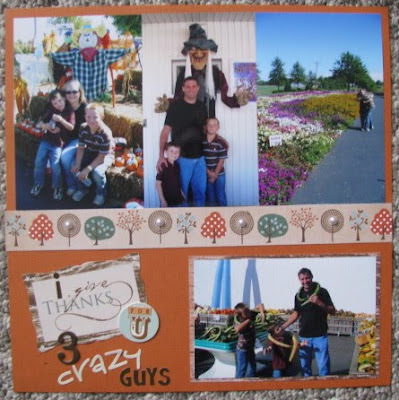 The word I used for them was "crazy" as in "I give thanks for U 3 crazy boys". 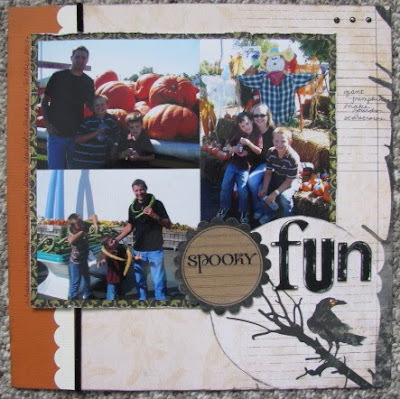 I used the new October Personal Scrapper kit for this layouts. Today was my day to give out a challenge and I gave a "Lucky" challenge to use the word in your title and/or scrap about something that is lucky to you. 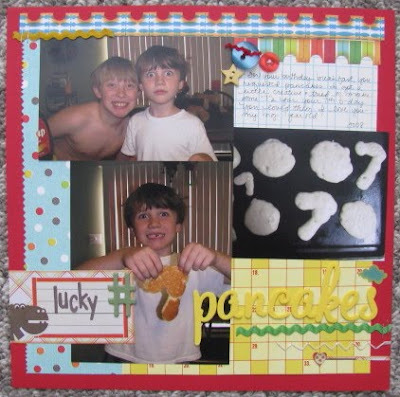 I scrapped Kevin's 7th birthday adn the #7 pancakes I made for him. This challenge was a cool one that used a bingo board with different supplies/techniques in each square. We were supposed to take a row and use those items/techniques on our page. Overachiever me used four different rows going two different directions. 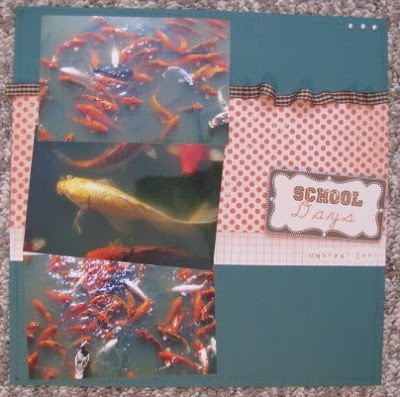 I used ribbon, 2 patterned papers, distressed edge, vintage feel, bling, journal spot, 2 colors cardstock, inked edges, handwriting, 3 brads, journaling around the edge and chipboard. I was rather stumped on the "Thanksgiving or cooking something special" challenge. 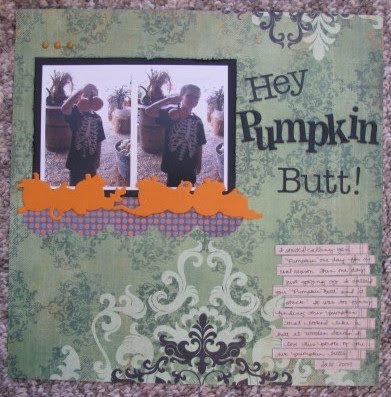 By then I was down to scraps with my October PS kit and there was a "give thanks" diecut. I decided to make a Thanksgiving card. (You don't have to may layouts for the challenge.) I finished the card and made six others to finish off the scraps of my kit. It is gone! This challenge was a fun one. You were supposed to make your own frame. I was using a PageMaps sketch (Oct. '09) that actually called for a frame on a photo. I simply handcut a frame out of chipboard, inked it and sprayed it with Pearl Glimmer Mist. I'm really happy with how this page turned out! Lovely work Amy, looks like you are keeping up with all the challenges! That School Days gave me a much needed chuckle today! Thanks for the smile! Look at you go! Great job on keeping up with the challenges. I LOVE your card set. It has inspired me to use up my scraps with that paper line.